Is That A Budweiser In Your Hand? : Product Placement, Booze, And Denzel Washington Priska Neely peeks inside the fully stocked minibar of Denzel Washington's Flight to find out how all those brand-name bottles get on screen — and what happens when nobody gets permission. Denzel Washington plays Whip Whitaker in Flight. 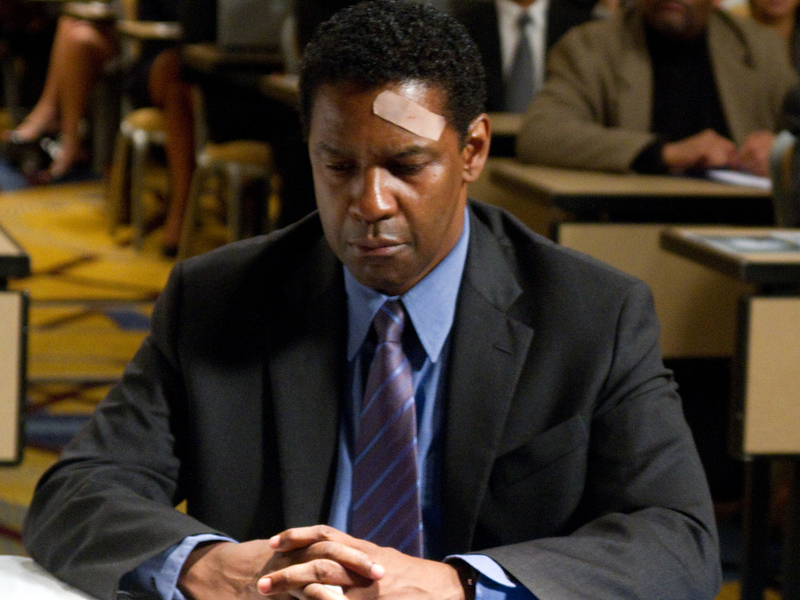 At one point in the film Flight, alcoholic pilot William "Whip" Whitaker, played by Denzel Washington, peers into a hotel-room mini-fridge filled with pretty much every type of wine and liquor imaginable. The shot showcases wine brands Yellow Tail, Barefoot, Sutter Home, plus Amstel Light and Heineken beers — even Red Bull. This scene raised a lot of questions for me: When has any hotel minibar ever contained so much alcohol? Why has Denzel done three films focusing on transportation –- two trains and now a plane — in as many years? And how did all of these alcohol brands get so much screen time? I imagined two possible behind-the-scenes processes: hordes of lawyers and interns making calls to Ciroc and Tanqueray asking for permission, or Ketel One paying Paramount Pictures lots of money to be featured. But it turns out that neither of these processes necessarily happened. Many of the beverage companies didn't even know their products would be featured in the film, and some of them aren't happy about it. 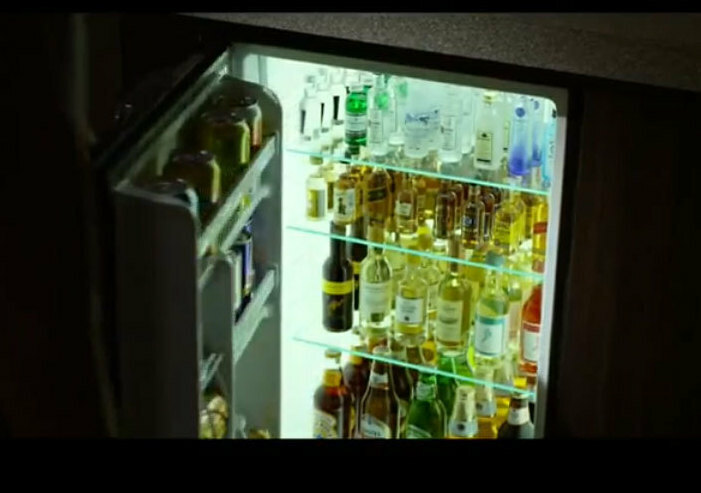 A screenshot from the trailer of Flight, showing the fully stocked (some would say too fully stocked) minibar. Anheuser-Busch said a couple of weeks ago that it has asked Paramount Pictures to obscure or remove Budweiser logos from DVD and On Demand versions of the film. The makers of Stolichnaya vodka have also asked that references to its brand be removed. Rob McCarthy, vice president of Budweiser, told the Associated Press that the company wasn't contacted by Paramount and did not grant permission for the use of the brand. And as it turns out, they didn't have to. "It's not something you're legally required to do," says Daniel Nazer, a resident fellow at Stanford Law School's Fair Use Project. "There's a big distinction between the culture of the content industry and the law." Nazer explains that the law doesn't extend to every situation that anyone imagines it might cover. "Trademark law ... exists to stop me selling my soda and calling it Coke; it doesn't exist to stop me making a TV show where one of the characters happens to have a can of Coke in his or her hands," he says. But why would the Paramount want to give brands screen time without getting paid? In this case, it was pretty essential to the plot. It was important for viewers to see Denzel drinking the same brands they see behind the bar. And if you think about it, why would any beverage company want to pay to have their brand portrayed in a film where alcohol is a villain? Much of this — whether a manufacturer will pay for its products to be shown at one extreme or will demand that they not be shown on the other — has to do with exactly how the product is portrayed. Heineken signed a reported $45 million partnership to have its beer featured in Skyfall. While fans may be disappointed that Bond is trading in his "shaken, not stirred" martini for the bottled beverage, it's not surprising that the beer company wanted to invest in the film. Bond makes alcohol seem cool; Flight makes it seem menacing. When product placement works this way, companies get contractual agreements, input and control. This is why we see Taco Bell Star Wars cups or Heineken commercials starring 007. Of course, the partnerships companies actively pursue don't always work out either. Reebok provided TriStar with more than $1.5 million worth of merchandise, marketing and other goodies to basically be one of the stars of the 1996 sports film Jerry Maguire. According to Reebok, there was a specific agreement about how the brand would be portrayed, and a full commercial for Reebok was supposed to be embedded in the film. That commercial, which showcases the company in a positive light, ended up on the cutting room floor, while an angry tirade that included broadsides against Reebok was kept in. Reebok took the case to court and got an undisclosed amount of money in an out-of-court settlement. When the film aired on TV, the commercial was back in. "It's a very tricky industry," says Cristel Russell, assistant professor of marketing at American University. "If a company produces a commercial, they know exactly what's going to be in the commercial. Product placement is very different. The movie people will always claim creative freedom." It may seem a lot easier for companies to advertise the old-fashioned way, but sometimes product placement really, really works. The tactic became a phenomenon thanks to an extraterrestrial fellow who hit the big screen in 1982. When E.T. follows a path of Reese's Pieces and meets little Elliot for a first time, the little orange, yellow and brown bits get lots of screen time. Steven Spielberg originally wanted to use M&Ms, but M&M Mars declined. The loss for Mars was the best thing that could have happened to Hershey. Sales of Reese's Pieces spiked, and that may well be the reason we still see them in stores decades later. Now, one more thing about Flight. If you're watching this movie with a newly tuned eye for product placement, you may notice that the film uses real alcohol brands, but a fictional brand of cigarettes. And it's not just this film: fans of Breaking Bad know that Jesse typically smokes the fictional Wilmington brand. That's because cigarettes open up a whole different can of worms because of the 1998 Tobacco Master Settlement Agreement, where the major U.S. tobacco companies agreed to stop certain marketing practices. "Alcohol is the next frontier," says Russell, who's working with the National Institutes of Health to study the effect of alcohol product placement on teenagers. Of course for beverage companies, the advantage of product placement involving alcohol is that they can get around some of the demographic constraints and unofficially target people under 21. It's safe to say plenty of teenagers will see James Bond drinking those Heinekens, after all. We'll have to wait until the DVDs come out to see whether a drunk Denzel is still behind the wheel with a Bud in hand, or whether he's been given some blurry, ambiguous brand. Companies who have taken cases like this to court in recent years haven't been successful. Slip 'N Slide unsuccessfully sued Paramount in 2003 over a scene in the David Spade film Dickie Roberts: Former Child Star that makes their product seem like a death trap. Caterpillar wasn't able to get its logos removed from tractors driven by villains in George of the Jungle 2. So for all of the movies and shows that black out Apple logos on the back of what is obviously a MacBook, or cover up all of the labels on water bottles, Nazer says that's not necessary. "The fact that [companies] can pay for control doesn't mean they have the right to control. And I think that's what leads to a lot of the confusion." When you do see covered labels or blotted out brand names, it may be because producers are trying to just avoid situations like this altogether. "The reality is that ... if you get sued, you probably still have to pay for your own legal fees," Nazer says. "I think that is part of [the] explanation about why so many studios are so reluctant to include real-world items in their productions. They're not worried that these suits are legitimate, they're just worried about the hassle." Meanwhile, I'm off to shoot a short film featuring every brand ever. Do you think anyone will mind?